Michaele Jordana is a transmedia artist and media designer whose multiplatform work explores the convergence of painting, photography, music, video and technology in digital media. A photorealist whose work is the collection of The National Gallery of Canada, Art Bank, and various collections including The Rogers Collection and First National Trust, Michaele began experimenting with technology in art in 1976 for her first show of super realist paintings, Oceans of Blood at The Isaacs Gallery in Toronto. Cyborg, her newest body of work - large-scale digital photopaintings, explores the human condition examining power, ownership, love and conflict. Working with PeakMedia since 1997, Michaele Jordana has designed large-scale video installations for public spaces including Winter Sky, that transformed the 24,000 sq. ft. vaulted canopy of Sherway Gardens into a digital fresco; and the 96-screen, 3-story synchronized video installation, The Media Tree , designed for the atrium of Casino Niagara. 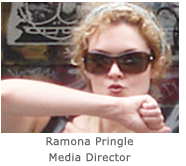 She has produced numerous immersive interactive web experiences including the first participatory online art school in Canada for Industry Canada - Artists in Electronic Residence; and Bad Bugs - an online Video Medical Symposium designed as a learning tool for leading doctors and specialists. With PeakMedia, Michaele has won the New York Film and Video Festival silver medal for her half hour docudrama Face to Face, which documents her pioneering work merging art and assistive technology to enable Down syndrome youth to communicate with ease. In the late 70's, Michaele Jordana pioneered the New Wave movement with her recording band The Poles - named after a trip to the North Pole. Her album was nominated for the Juno and won the first Casby Award. 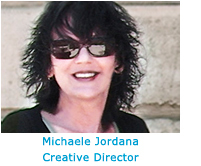 As an Art Educator, Michaele Jordana has taught painting, video production, media, design and gameworlds throughout her career at institutions including Three Schools of Art, York University, University of Guelph, the University of Ontario Institute of Technology and Centennial College School of Media and Design. Michaele has a BFA Honours degree from the University of Manitoba and her awards include several Canada Council and Ontario Arts Council Grants.